The internal politics of Venezuela is playing a big part in the sudden deterioration of that country’s relations with its smaller neighbour Guyana after a period of steady improvement. Elements in the military apparatus of Venezuela appear to be determined to press a spurious claim to two-thirds of Guyana’s territory. On present evidence, it seems that, unlike his predecessor Hugo Chavez, President Nicolás Maduro lacks the clout to restrain them. There have been two serious actions taken recently by the Venezuelan military. The first was on August 31, the very day that Maduro was paying an official visit to Guyana to release with the President of Guyana, Donald Ramotar, a joint declaration of co-operation. Armed and uniformed Venezuelan soldiers entered Guyanese territory with a party of civilians. One of the civilians, a law student identified as Ricardo de Toma, is reported to have said: “We came here to carry out a civil exercise of sovereignty, but we do not understand what was Nicolás Maduro doing there (in Guyana)”. The second military incident is the arrest and detention on 10 October of a survey ship used by Texas-based Anadarko Petroleum Corp which had been granted an exploration licence by the Guyana government in a southern Atlantic block named Roraima. Both the Guyana and Venezuelan governments say that the ship, the RV Teknik Perdana, was in their territorial waters. The fact is that the ship was in Guyana’s territorial waters which the Venezuelan government unlawfully claims. A spokesperson for the Venezuelan Foreign Ministry is reported by the Venezuelan Newspaper El Universal to have said that “Venezuela expresses its profound concern about the way in which foreign vessels, authorized by Guyana's government, barge into Venezuela's territorial waters and exclusive economic zone without permission." In a previous commentary, I had pointed out that shortly after Guyana issued the exploration licence for the Roraima block on 26 June, El Universal carried a story claiming that the Venezuelan Navy had “raised the alarm” about an oil concession granted by the Guyana government “in front of the Venezuelan Atlantic front of Orinoco Delta”. The unnamed source “revealed that the Navy was concerned about the way this issue is being tackled, namely, Venezuela's claim over the Essequibo and its silence over multiple actions carried out by Guyana in the area”. Even earlier, in September 2011, when Guyana applied to the United Nations to extend its continental shelf, Venezuela's foreign ministry described the application as an "irregular situation" and said it was working to protect its maritime rights. The action by the Venezuelan navy to detain the survey ship shows a determination by the Venezuelan military to maintain and fuel hostility toward Guyana. A subsequent meeting in Trinidad and Tobago on 17 October between the Guyana foreign minister Carolyn Rodrigues-Birkett and the Venezuelan foreign minister Elías Jaua Milano resulted in a stand-off. They were unable to resolve the issue of the ship’s detention despite the formal language in a joint statement that they “recognized that the delimitation of maritime boundaries between their two States remains an unresolved issue and agreed that such delimitation will require negotiations. In this regard, (they) agreed to explore mechanisms within the context of International Law to address the issue of maritime delimitation, and that within the next four months a technical team will meet to exchange views on how such delimitation could proceed”. But four days after the meeting, El Universal reported that “sources said that at such upcoming meetings Venezuela would advocate the stance that maritime delimitation is impossible, insofar as no satisfactory solution is found for the practical settlement of the controversy between Venezuela and the United Kingdom”. The work of any technical team, therefore, seems doomed before it even starts. 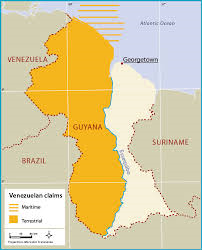 The effect is that, not for the first time, through the use of military force, Venezuela has again stopped Guyana from pursuing the economic benefits of its territory - both land and sea. And this is being done on a basis that has no legal foundation. In 1899, an Arbitral Panel of distinguished judges reached a "full, perfect and final settlement” of the border dispute. The issue was re-opened in 1962 by then Venezuelan President Rómulo Betancourt for avaricious and ideological reasons, absolutely unrelated to legality. According to declassified US State Department documents, Betancourt professed “to be greatly concerned about an independent British Guiana with Cheddi Jagan as Prime Minister” who he suspected “is already too committed to communism”. Betancourt is reported in the documents covering the period 1962 to 1965, as being “convinced that the area contiguous to the present boundary abounds in natural resources”. He proposed to both the British and the Americans that they agree to zone it for development by private funds from Britain and the US “under Venezuelan sovereignty”. This, he said, would stop “the danger of infiltration of Venezuela from British Guiana if a Castro-type government ever were established”. His position was founded on avarice and constructed on a cold war ideology that has cast a long shadow over Guyana. This was the real basis for the Venezuelan claim even though Betancourt’s government’s position in the international community was that the decision of the Arbitration was fraudulent. The declassified documents reveal that neither the British nor the Americans gave him any encouragement or support. Nonetheless, he pursued it. And, over the years, nationalist hostility toward Guyana has been generated and enflamed in Venezuela on the bogus assertion that the 1899 award was a fraud, despite the fact that it was accepted at the time and not challenged for 63 years. Regrettably, every Venezuelan government – until the latter years of Hugo Chavez’s Presidency – has promoted that false claim. They have done so even in the school system, so that every child grows up nurtured on it. The lie is now so all pervasive that even political leaders who know the truth are trapped by its consequences. That, in part, is the dilemma of President Maduro. How does he break away from this claim to Guyana without being branded a traitor by those in the Venezuelan society whose interests it serves? It is a dilemma which neighbouring countries, particularly Brazil and the countries of the Caribbean Community (CARICOM), must help him to resolve. A possibility now opens in proposals (the details of which are not yet known) from the UN Secretary-General’s Good Offices representative over the Venezuela-Guyana issue, Professor Norman Girvan. Undoubtedly, Girvan’s proposals will be within the framework of international law and precedence. They should have broad appeal to any government that is willing to bring an end to this controversy that has hurt the potential economic integration and growth of Latin America and the Caribbean as a whole, and that has stood in the way of wider and deeper co-operation between Venezuela and Guyana that would benefit both their peoples. Guyana’s development should not continue to be unfairly stunted by - nor should the country have to continue to live under - the threat of Venezuelan military intervention.